Heather Lang: The other day, after cleaning my house, I found myself staring—just sitting and staring—at the space I had created: the white wall beneath the oval mirror, above the bookshelf, and to the right of a small family photo. There was a flat surface with nothing on it, and it felt good. This will likely sound ridiculous, but I stared at this nothingness and took it in, finding a peacefulness that I hadn’t felt in weeks, maybe longer. Most likely nobody but me cares about my clean shelf. However, when I revisited your chapbook, Pupa, I realized that you, Sam, articulated the larger sentiment that I could not. In “It’s Easy to Forget the Joy in Gaps,” for example, you write, “Take the whole tooth, Doc— / give me steel on bone.” You write, “how afraid I am / to admit absence makes my life worth living.” Although I had already admired Pupa, your ability to explore and map out the emotional significance of negative space heightened my attention. Another example can be found in “Things I Wish I Told My Mother.” You write, “Thank you for rescuing me from Clint’s trailer,” admitting that she was “right not to like him,” and this rescue results in a removal, a type of absence, a negative space of sorts. Pupa also demonstrates a sense of anticipation through emptiness as a “mother’s mason jars” are “set as snares” in “Entomania.” I could go on. In what ways did you intend for Pupa to be about negative space, loss, and/or anticipation? Samuel Piccone: First off, thank you so much for taking the time to read my book and your kind words about it. I’m very grateful for the opportunity to talk about it a bit. You know, I think the amount of negative space in the poems is simply a result of how much they are about growing up. For me, the moments when I was most directionless or unsure of who I was ended up playing the biggest roles in my development as an adult. And I think coming of age works in this way for a lot of people. It’s very much an act of loss and replacement—we give up a part of ourselves and wait to be filled with something more meaningful. At the time, it can feel very exciting or hopeful, that possibility. But in hindsight, it’s easy to say “I’ve changed,” and wax nostalgic about the self you used to be. Those empty/hopeful moments in the poems give shape to the material that surrounds them—like your mirror or the family photo. I imagine those objects emerged from the clutter and became a frame for what used to be there. I like that idea, keeping a little hollow place at the center of a poem. A reader can step inside and test their own negative spaces in a framework that’s different than their own. 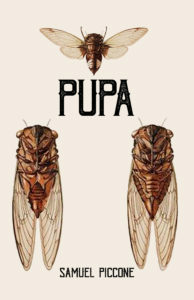 HL: There are, at least, two other themes that stand front and center in Pupa, and they seem to be married throughout the chapbook: entomology and coming of age. I was prepared for this pairing by the title Pupa, which refers to insects and, more specifically, their phase between larva and adult. Could you tell us how you happened upon this combination of themes? What, for example, compelled you to compare a hand to the “mandible / of a stag beetle” in “Inheriting My Father’s Hands”? SP: E.O. Wilson has this quote I’ve always liked: “Every kid has a bug period…I never grew out of mine.” I think I fall into that category. Insects have always been this strange obsession of mine—I enjoy looking closely at them, reading about them, etc. But at the same time, I’m quite afraid of them (there’s a dead scorpion in the chamber of my vacuum cleaner right now that I can’t stop staring at, partially because it creeps me out). The connection between this idea and coming of age didn’t really reveal itself to me until I wrote the poem “Kaufman’s Field Guide to Insects of North America.” There’s a line that goes, “I worried I was getting lost to scare myself into paying attention to the world again,” and when I realized how accurately it expressed both my relationship with insects and coming of age, I just started pushing those ideas together as much as I could. For me, insects work as this strange but incredibly accurate mirror for a lot of human behavior, especially when it comes to family and relationships. There are so many tiny details, that when examined close up, are unique and odd and impressive. Yet at the same time, those details can be kind of cringe-inducing when we see them functioning as part of a whole. It’s such a strange mix of characteristics, made even stranger by the fact that humans and insects share them so closely—it’s endlessly fascinating to me. HL: I was hoping to ask you a bit about form. There are stanzas of many shapes and sizes throughout this twenty-poem chapbook. However, there are a number of poems in couplets, and this brought my attention to the tercets, too, and the singular block-justified prose poem caught my attention, as well. What lead you to craft “Kaufman Field Guide to Insects of North American” as a prose poem? How did you decide which poems should settle into couplets versus longer stanzas? SP: That’s a tough question, mostly because I don’t feel like form is something I get to “decide” as much as it is something I have to get right. My only goal is that the form matches the content, and that usually revolves around finding something that’s paced appropriately, lines and stanzas that can add layers of meaning beyond the poem as a whole, those kinds of things. I enjoy form, so I don’t mind running a poem through several variations, and I think seeing the poem in a lot of different ways helps separate good material from bad. “Kaufman” was a poem I almost scrapped in grad school, but I was in a class taught by Eduardo C. Corral where he gave us this exercise of taking a poem that wasn’t working and turning it into a prose poem as a way to read sentences instead of lines. Needless to say, it helped me fix a lot of problems and ended up working alright. And I think approaching form as a revision tool that I could play around with made it easier for me to step back and simply listen to the poem. It will let you know when it takes the shape it wants. HL: May I ask what you’re working on these days? In which ways are your current projects similar to Pupa, and how are they different? SP: Right now I’m working on my first full-length collection, which focuses on marriage and domesticity through the lens of place, specifically the Midwest and the desert (sort of a way to explore the lines between interiority and exteriority). There’s still a fair amount of coming of age material, but the narrative is a bit different. Not as many bugs—a lot of birds for some reason. But, birds gotta eat, so I find places throw a worm or two in there. HL: Thank you, Sam, for chatting with me about your poetry. Pupa is the type of chapbook that demands immediate attention but also waits patiently on its shelf for the reader to return again and again. It laces thoughts throughout mind and memory, which sing out especially during precious moments of quiet. Thank you for putting these resonant poems out into the world and for sharing a bit about your inspirations and processes. Heather Lang is World Literature Editor at The Literary Review.